If you have not heard yet, the legendary Chuck Berry has died. It would be difficult to find an artist who had more influence on rock 'n' roll. He endowed rock 'n' roll with a purer electric guitar sound than those few rock 'n' roll stars who preceded him, and he elevated the importance of the guitar solo. Without Chuck Berry we would not have The Beatles, The Rolling Stones, The Who, or many other rock bands. In fact, it might well be impossible to find a rock artist who was not influenced by Chuck Berry. I am busy preparing a very important post for tomorrow, so I don't have time to eulogise Mr. Berry yet. I will then leave you with my all time favourite Chuck Berry song, "No Particular Place to Go". I don't celebrate St. Patrick's Day myself. It's not that I have anything against the day. It's a simple case that I am not Irish, Nigerian, Montserratian, Catholic, an engineer, or a paralegal, and growing up my English/German household ( with some Scottish and Cherokee thrown in for good measure) never observed the day. That having been said, I do enjoy watching other people celebrate St. Patrick's Day, and I am happy when any day brings others joy. I also have to say that while I don't have a drop of Irish blood in me, I do have an appreciation for Irish history and culture. Here then for those who do celebrate St. Patrick's Day are five movies more than suitable for the day. Hungry Hill (1947): Hungry Hill is based on the novel of the same name by Daphne du Maurier. It centres on two feuding families. Some of the film was actually shot in Ireland (County Wickow, to be exact), although most of it was shot at Denham Studios in Buckinghamshire, England. Admittedly the leads are about as Irish as I am, but both Margaret Lockwood and Dennis Price give sterling performances, as does the rest of the cast. And while Hungry Hill runs only 92 minutes, it has the epic feel of a longer film. Indeed, the film's composition is beautiful, with several impressive shots throughout. The ballroom sequence is not to be missed. The Quiet Man (1952): The Quiet Man is about as Irish as a Hollywood film can get. It was directed by a man of Irish descent (John Ford) and stars perhaps the most famous Irish actress of all time (Maureen O'Hara). Much of the film was also shot in Ireland (County Mayo and County Galway). It is beautifully photographed and benefits from a solid script as well. There really isn't much more I can say about The Quiet Man that hasn't been said before. It's considered one of John Ford's best films. Darby O'Gill and the Little People (1959): For better or worse, I suspect this is what comes to the minds of most people of my generation when they think of movies about Ireland. Except for the noticeably Scottish Sean Connery and the noticeably English Janet Munro, the cast is filled out by some fine Irish actors, including Albert Sharpe (as the title character), Jimmy O'Dea, and Kieron Moore. Darby O'Gill and the Little People is also a whole lot of fun and draws a bit upon Irish folklore, from leprechauns to banshees. I'm not sure what people from Ireland actually think of the film, but for this Sasanach it is one of the most enjoyable live-action Disney films of its era. The Secret of Roan Inish (1994): The Secret of Roan Inish is based on the novel The Secret of the Ron Mor Skerry by Rosalie K. Fry, which is actually set in Scotland, but the location was moved to Ireland with appropriate changes made for the movie. Most of the film was shot in County Donegal, Ireland, with some scenes shot on the Isle of Mull in Argyll, Scotland. The film draws heavily upon Irish folklore, particularly myths about the selkies common to Ireland, Scotland, and the Faroe Islands. It has a great script and it is also beautifully shot. In fact, I think it would be apt to call it a poem on film. While fans of The Quiet Man might disagree with me, it is possibly the best film on this list. Song of the Sea (2014): Song of the Sea is a cel animated film from the same people who made the earlier animated fantasy The Secret of Kells (2009). 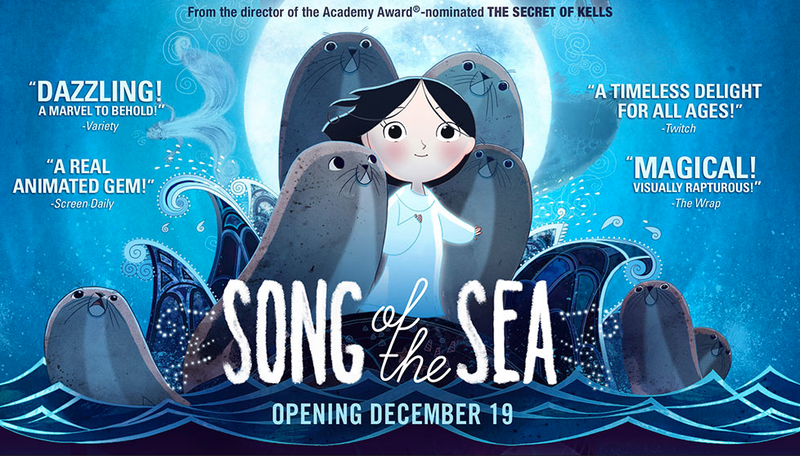 It is an absolutely beautiful film that draws heavily upon Irish mythology, not only including selkies, but such figures as Manannán mac Lir and Macha. It also boasts well-developed characters and a very good story. For fans of animation it is a welcome break from many of the animated films emerging from Hollywood these days. This is just a reminder that my 3rd Annual Favourite TV Show Episode Blogathon begins next Friday, March 24, and runs though (and including) Sunday, March 26. There's still time to sign up to write an entry. You can do so here at the original announcement post. On March 24 I will will set up a post that will include all of the posts in the blogathon. Here's to another successful blogathon!